We offer "one visit" Cerec crowns. Step 1 – The doctor examines your teeth and determines the appropriate dental treatment to be performed. 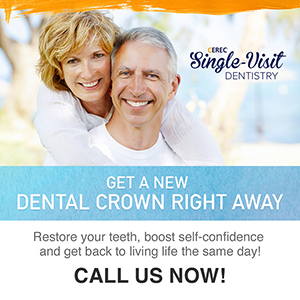 The dentist will need to see if you need a full dental crown or simply a dental filling. If a crown is necessary, the doctor prepares the affected tooth for the procedure. Decay is removed from the tooth and any infected tissue. This is a typical restorative technique that dentists often do during a dental restoration. Step 2 – The dentist takes a digital impression of your prepared tooth. This digital image of your tooth is then sent to the CEREC® system to be analyzed. This step takes no more than a minute or two to complete. Step 3 – The CEREC® software converts your dental impression into a 3-dimensional virtual model. The doctor uses this information to design your dental crown. Since the software aids the doctor during the design process, the restoration design is more accurate and precise than when the traditional method of designing a crown was done. In a matter of minutes, the design is finalized and sent to a milling unit to be fabricated. Step 4 – The CEREC® milling machine creates the dental crown based on the design supplied by the software. The crown is crafted out of a ceramic block that matches the shade of the patient’s teeth. Crown fabrication is done inside the dental office and before you know it, your crown is done and ready to be fitted and bonded over your tooth. Step 5 – The doctor tries the dental crown on your tooth, to check the fit. He makes final revisions should they be necessary. Once the right fit is achieved, the doctor proceeds with the bonding process. The crown is bonded over the tooth, and then polished to perfection. The dentist removes any excess bonding cement and makes sure that the crown looks great in your mouth. Your tooth is restored all in a day’s work. There’s no need to wear temporaries or schedule another office visit for additional dental work. You basically come out of the dental practice with your dental crown in place.